For other people with the same name, see William Davis. 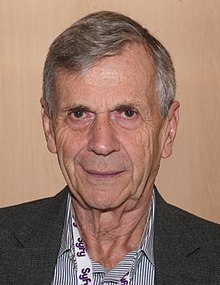 William Bruce Davis (born January 13, 1938) is a Canadian actor and director, best known for his role as the Cigarette Smoking Man on The X-Files. Besides appearing in many TV programs and movies, Davis founded his own acting school, the William Davis Centre for Actors Study. In his personal life, Davis is an avid water-skier, lectures on skepticism at events such as the Committee for Skeptical Inquiry's CSICon, and advocates for action on climate change. In 2011 Davis published his memoir, Where There's Smoke .... The Musings of a Cigarette Smoking Man. Davis was born in Toronto, Ontario, Canada, to a lawyer father and psychologist mother. He began his acting career as a child in 1949, in radio drama and summer stock theatre. His cousins Murray and Donald Davis ran the Straw Hat Players in Ontario in the late 1940s and early 1950s, and rehearsed in the basement of Davis' house. When they needed a boy they gave William his first professional acting job. He went on from there to have a career as a boy actor on Canadian Broadcasting Corporation radio before his voice broke. In 1955 he enrolled in the University of Toronto to study philosophy, but actively pursued a career as an actor alongside future actor Donald Sutherland. In 1959, he graduated from the University of Toronto with a Bachelor of Arts in philosophy. While at university he switched his attention from acting to directing and with his partner, Karl Jaffary, took over and ran the Straw Hat Players for four years. In 1960 Davis went to England to train at LAMDA (The London Academy of Music and Dramatic Art). He worked in the UK for the next five years directing in repertory theatres and acting schools. He was artistic director of the Dundee Repertory Theatre. His last position in the UK was as an assistant director at The National Theatre of Great Britain under Laurence Olivier where he worked with Albert Finney, Maggie Smith, Derek Jacobi, and Ronald Pickup among others. He returned to Canada in 1965 to work at The National Theatre School of Canada and soon, at the age of 28, was appointed artistic director of the English Acting Section. During this period he was also active as a freelance director at major Canadian theatres. In 1971 he joined the newly formed Drama Department at Bishop's University in Lennoxvile, Quebec. While there he became the founding artistic director of Festival Lennoxville, a professional summer theatre that ran for the next decade. Returning to Toronto in the late seventies Davis spent several years as a radio drama director and on the faculty of Humber College. In demand as an acting teacher during this period, he resumed acting after an absence of nearly twenty years. Davis earned a number of roles on stage and film before accepting the position of artistic director of the Vancouver Playhouse Acting School, which required relocating with his wife and family. Davis writes in his memoir, "And so, in the fall of 1985, we hitched our second hand boat to our second hand car and drove across the country". While his time at the Vancouver Playhouse was short-lived, he remained in Vancouver where he founded his own acting school, The William Davis Centre for Actors Study, a training ground for several future stars including Lucy Lawless. Acting roles became more frequent leading to his iconic role, The Smoking Man (also referred to as "The Cancer Man"), on The X-Files where he made frequent appearances for the next nine years. In addition to The X-Files, Davis has played a wide range of roles, on series from Stargate SG-1 to Smallville and a host of television movies and other projects. From time to time he attends fan conventions, signing autographs and copies of his memoir. In recent years Davis has returned to directing for theatre and film. He wrote and directed three short films and co-wrote and directed several episodes of a television series for CBC Television, 49th & Main. In 2011 he directed two plays for The United Players of Vancouver, Waste by Harley Granville Barker and Hay Fever by Noël Coward. Most recently he directed The Habit of Art (2013) by Alan Bennett, Sherlock Holmes and the Case of the Jersey Lily (2015) by Katie Forgette and Robert Bolt's A Man for All Seasons at the Jericho Arts Centre in Vancouver, British Columbia. During that period, he also aired in 10 episodes of the Canadian hit show Continuum as Older Alec Sadler on Showcase. Most recently, Davis reprised his iconic X-Files role in the six-episode Season 10. Despite being known for his smoking character, Davis quit smoking in the 1970s; when The X-Files started up, he was given a choice between herbal cigarettes and tobacco cigarettes. At first, he chose to use tobacco cigarettes, but switched to herbal because he was afraid of becoming addicted to them again. Davis used his notoriety on the show to assist the Canadian Cancer Society in its programs to combat smoking. In 2014, Davis donated his investments that support fossil fuels to the David Suzuki Foundation in an effort to both ethically invest, and help fund work to fight climate change. Davis is a passionate advocate for action in response to climate change, believes it is a critical issue of our time and speaks on the subject often. Taking action on a personal level, Davis drives a Tesla powered by hydroelectricity. He is also a former national champion water skier and for a time held various records in older age divisions. In a conversation with Brendan Beiser, Davis states he holds the record for tricks in his age category, adding "I did hold the slalom record until this past year until some young whippersnapper of 65 from Ontario took the record away from me". In 2011, Davis married Emmanuelle Herpin. He has two daughters, Melinda and Rebecca, from an earlier marriage. He also has two grandchildren. While on The X-Files, Davis was constantly challenged by The X-Files fans about his non-belief in the paranormal and aliens. Davis credits Barry Beyerstein and Committee for Skeptical Inquiry (CSI) for introducing him to the skeptic community. Davis became increasingly involved in the skeptical movement and began to give lectures as a skeptical spokesman at universities across North America and at skeptic conventions, including CSI's CSICon in New Orleans. When asked about his belief in the paranormal at the London Film and Comic Con in 2010, Davis replied, "The onus is on you to prove the extraordinary ...I did a lot of research and saw where a lot of the arguments were wanting." Interviewed by Jacob Fortin on guilt about being a skeptic on a show that Richard Dawkins campaigned against, Davis replied that at first he had some trepidation until realizing that Dawkins "had no evidence whatsoever and presented none" that the show encouraged people to think uncritically. "The show is fiction... it isn't a documentary." In another interview with Justin Trottier of Centre for Inquiry Canada Davis answered similarly, adding that from his own informal polls of audiences of X-Files fans it seemed there was no greater belief in the paranormal than the normal population and he comforted himself with this thought. Asked about a debate Davis moderated with alien abduction believer John E. Mack, Davis said that many people expected him to support Mack, but they discovered that he was "way on the other side". Davis recounted that he had some great discussions with Mack; "He was brilliant... he was wrong, but he was very good... One of the problems with human intelligence is that we are so good at defending ideas that we arrived at irrationally." ^ Davis, William B. (2011). Where There's Smoke: Musings of a Cigarette Smoking Man, a Memoir. ECW Press. p. 4. ISBN 978-1-77041-052-7. ^ a b Brendan Beiser (June 16, 2008). "William B. Davis - This Conversation". This Conversation TV. Retrieved December 2, 2011. ^ a b "William B. Davis on Fame Dragon Con 2010". September 12, 2010. Retrieved December 2, 2011. ^ Fred Euringer (2000). A Fly on the Curtain. Oberon Press, 978-0778011415. page 103. ^ "History 1960-1969". National Theatre School of Canada. 2008. Archived from the original on August 27, 2011. Retrieved December 2, 2011. ^ a b "Program Advisory Committee". Vanarts. 2011. Retrieved December 2, 2011. ^ "Festival Lennoxville". Canadian Theatre Encyclopedia. November 17, 2006. Retrieved December 2, 2011. ^ "Expanded Bio for Lucy Lawless". Lotolux. Retrieved December 16, 2011. ^ a b "William B. Davis Interview". LSQTV 2010. July 18, 2010. Retrieved December 2, 2011. ^ "Past Plays 2010 - 2011". United Players of Vancouver theatre company. Retrieved February 18, 2015. ^ "William B. Davis - News". Official site of William B. Davis. Retrieved December 16, 2011. ^ "Past Plays 2011 - 2012". United Players of Vancouver theatre company. Retrieved February 18, 2015. ^ "Past Plays 2013 - 2014". United Players of Vancouver theatre company. Retrieved February 18, 2015. ^ "SEASON 2014 - 2015". Jericho Arts Centre. Retrieved February 15, 2015. ^ Nuytens, Gilles (October 11, 2005). "Interview with William B. Davis". The Sci Fi World. Retrieved July 11, 2009. ^ "Potpourri". Tobacco Control. Retrieved December 3, 2011. ^ Sentes, Rachel (December 11, 2014). "Actor's Divestment from Oil Used to Support Suzuki Foundation". Scribd. Retrieved February 18, 2015. ^ a b "William B. Davis - Personal". Official Site of William B. Davis. Retrieved February 14, 2015. ^ a b "William B. Davis Fan Page". Facebook. May 24, 2011. Retrieved February 20, 2015. ^ Allison Cossitt (March 1998). "Cigarette-Smoking Man". Committee for Skeptical Inquiry. Retrieved December 7, 2011. ^ John Semley (October 18, 2011). "Random Roles: William B. Davis". A.V. Club. Retrieved October 26, 2011. ^ X-Files' William B. Davis AKA Cigarette Smoking Man on Atheism, Skepticism and Life (Video). Think Again! TV. March 2, 2012. ^ Jacob Fortin (December 22, 2011). "The Good Atheist Podcast: Episode 154". The Good Atheist. Retrieved December 25, 2011. Wikimedia Commons has media related to William B. Davis. This page was last edited on 19 February 2019, at 01:10 (UTC).